A.M. A very Uneventful Half-Marathon with Ted. Daniel joined us for the first 2.5, then turned around. The most likely events would have been slipping and falling on ice, so we tried to keep it as uneventful as possible. Managed to catch the 8:00 guy and even put some distance on him nevertheless. Total time was 1:42:44. A.M. Ran with Ted at 5:10 AM. It was 21 degrees, dark, and slippery, although not as bad as yesterday. Not in the mood to do a tempo, but ran brisk to get Ted to work on time. Stopped around 9.6 for VPB, told Ted to go ahead. Thought I'd catch him easily going 5:30. Well, I thought I could go 5:30, but with the cold, dark, and ice patches all I could manage was 6:00. And Ted being in a hurry to get to work went 6:20. So it took me a good 2.6 to catch him. Dropped him off at 14.1, then added another 1.05 around the block in 6:17 - 90 degree turns are not good with ice on the ground. 1:41:33 for 15.15, 6:42.18 avg. P.M. 1.5 with Jenny in 14:33, 2 with Benjamin in 17:18, 1.05 with Julia in 11:11, then a short tempo pick-up - two laps around the block by myself (0.7) in 3:57, 5:38.5 avg, first lap in 2:00 (5:42.86 pace), second in 1:57 (5:34.29). On the first lap had to dodge two cars, this moved me into the snowy/icy part twice. On the second lap there was only one car, it was polite and moved out of the way. Had to ease off on the turns, they were icy/snowy. Felt strong and relaxed. Later in the evening we learned a sad news. Our good friend and neighbor who acted like an adopted grandpa for our kids, and especially for Julia, passed away from a heart attack. Julia always sat on his lap during the Sacrament meeting at church. He even made a bird house for our girls, and was in the process of making a doll house in spite of not feeling that great - that was his way to show love. His physical heart was weak and did fail, but his spiritual heart did much better. So I feel sad that he is not with us any more, but I feel happy for him that he truly endured to the end, and moved on to better things when his time came. A.M. Ran at 5:00 AM alone. It was fairly cold, somewhere in the 20-25 range. Started out slow, stayed slow through the first 1.5 because of the snow/ice. At 1.5 was 38 seconds behind the 8:00 guy. Then got out on drier ground with more traction and picked it up. Decided to run marathon pace on dry spots, and jog on the snowy/icy ones. Ended up with 1:06:40 for 10.1, and about 4 miles of tempo running. Last quarter was 1:21 trying to catch the 1:06:40 - this was quite an experience in the dark and with 3 90 degree turns. P.M. 1.5 with Ted, James, Jared, Jenny, and Benjamin in 13:22. Benjamin was 2 seconds ahead, and Jared 2 seconds behind. Then another 0.5 after dropping Jenny and Jared off in 3:35. Then 1.05 with Julia in 11:12. Then 5 miles with Ted in 38:36. Would have been uneventful were it not for two dogs that jumped out of nowhere and ran after us. Then we shared war stories about animal encounters. Ted's running partner once got bitten in the buttocks by a little dog with a very good vertical jump. A.M. Ran with Ted at 6:30 AM. Uneventful 15.1. Very slippery roads, record for this year so far. We had a great debate going on a variety of topics. Ted knows he needs to hit controversial issues to keep the pace slow on uneventful days, such as stating that I have as much slow twitch fiber ratio as Alberto Salazar. When we convert 10% of the US population to competitive running, perhaps we can start a Ted and Sasha Uneventful 15.1 Talk Show. Total time was 1:53:21, 7:30.4 avg. P.M. 1.05 with Julia in 11:09, 1.5 with Jenny and Jared - they whooped the 9:00 guy coming from behind - Jenny got 13:17, Jared 13:21. I think we should have named Jenny Catherine after Catherine Ndereba - she runs just like her on a good day. A bit slow to start, then getting progressively faster, and closing furiously. Then 2 miles with Benjamin. He started at a bit faster than 9:00, then fairly quickly progressed to 8:00. I told him that the 8:00 guy was getting concerned. He said he was not chasing him. I told him the 8:00 guy was concerned anyway. He eventually eased into 7:20 pace, and thoroughly whooped the 8:00 with 15:49 for the whole run. Added another 0.7 in 5:00 afterwards. A.M. Exceptionally uneventful 20.1 First 15.5 with Ted. Total time 2:26:59. Did not like the snow or the layers of clothes. The only event was measuring our strides in moderately deep snow in the park. Both of us have a discrepancy of 3 inches, but Ted has a very funny way of landing on one of his feet, but not the other - it hovers right near the ground for a while before it lands. Went to our adopted granpa's funeral afterwards. There they sang Be Still My Soul. This is a special song for me. It brought some memories. In the beginning of 2003 I was having a hard time. I was not happy with my job, or my running. I felt I had reached a plateau, and felt condemned to stay at it. I had exhausted the limits of Sasha Science of the day to make me any faster. The only thing that was left to keep me trying was Sasha Faith, and humans by nature have ups and downs in their faith. One winter day that year with lots of snow on the ground I found myself alone 8 miles into a 15 mile run, and 7 miles away from home in a fairly deep snow. Every step was a struggle. My faith was wavering. Is it even worth it to keep trying so hard? I felt like I wanted to lie down in the snow and just stay there. Then in my mind I heard the words and the tune of Be Still My Soul. This revived my spirit, and I continued the run, still struggling through the snow, but with a much different perspective. Eventually Sasha Faith produced an advance in Sasha Science, which led to a breakthrough. 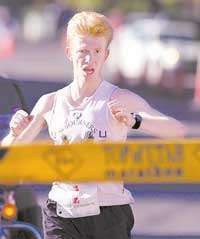 It happened in the Top of Utah Marathon that same year. I ran that race with a lot of power. But that power, manifested on the day of the race, had its roots in that run on that dull winter day with God lifting up my soul and telling it to be still, reviving my faith at its down. That is one reason TOU 2003 is a very special race for me, and that is why I still keep the picture from that race on the blog. It will be there until something equally special takes place. P.M. 5 miles by myself (kids ran earlier with Sarah) in 36:25. Still slippery. Picked it up on the last 0.25, ran it in 1:25.